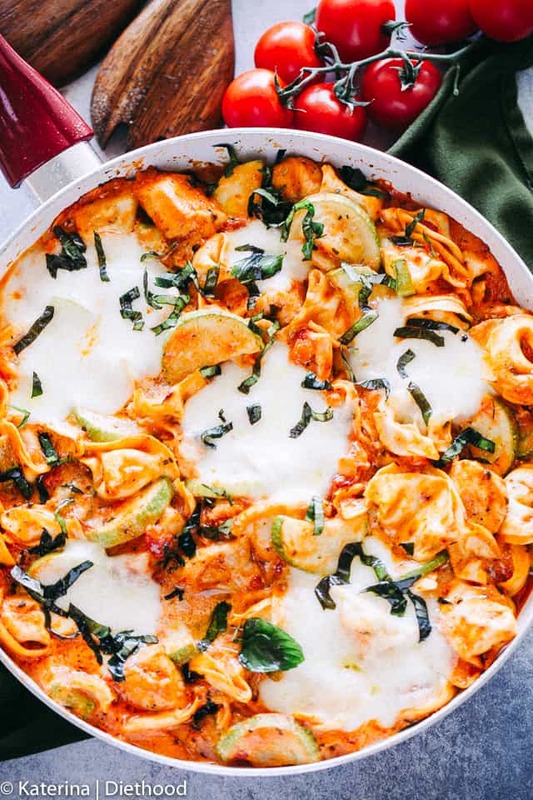 One Pot Italian Chicken Tortellini Recipe – A delicious and easy dinner recipe packed with chicken, zucchini, cheese, and tortellini! Get ready for a wonderful, picky-eater approved, 30-minute meal prepared in just one pot! 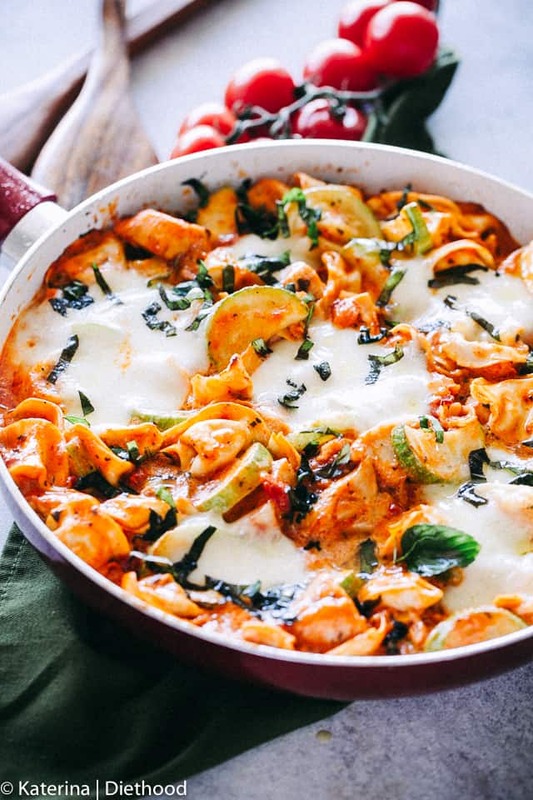 Italian Chicken Tortellini is the perfect and quick pasta recipe for your weeknight dinners with chicken, fresh mozzarella, tortellini and veggies. It’s very easy to make and it tastes incredible. You guys, my family loved loved loved this meal. Normally, I try to stay away from pastas and lots of cheeses, let alone talk too much about them on Diethood, buuuuut, some things just deserve to be told. 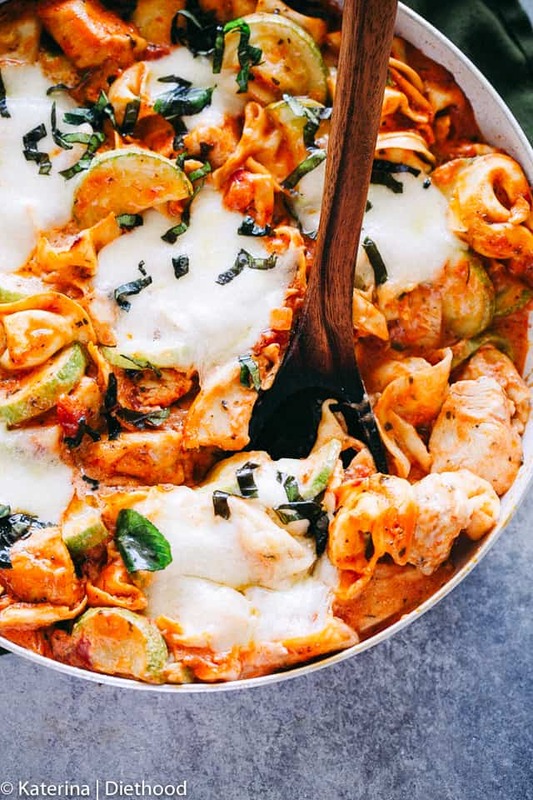 That is the case with this One Pot Italian Chicken Tortellini Recipe. First of all, don’t know if you can recall – probably not and I don’t expect you to – but this recipe came about after I made that Creamy Chicken Pesto Tortellini recipe for us a few months back. 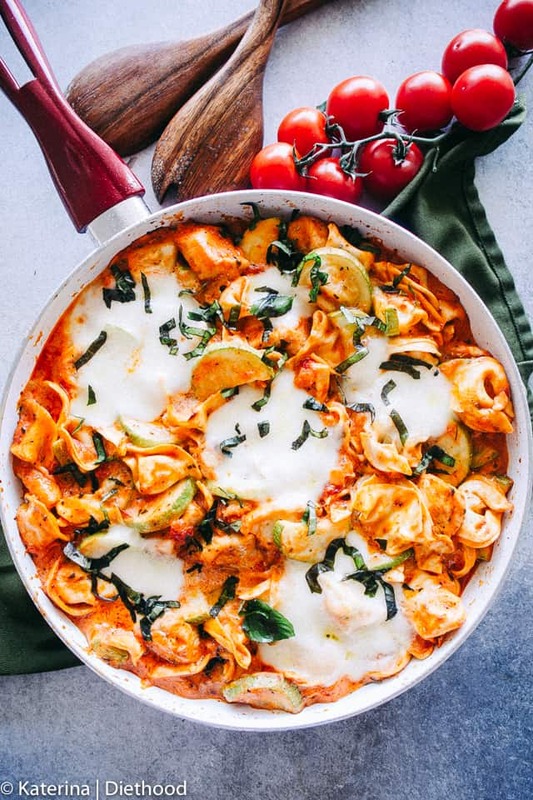 Because I was left with several boxes of frozen cheese tortellini, I decided to make something similar to it, but with marinara sauce in place of the creamy pesto sauce + zucchini + all in one pot. And in 30 minutes. Cut up the chicken into bite sizes and brown on all sides. Cut the zucchini into half-moons; set aside. In a bowl, combine wine and chicken broth and whisk until incorporated. Add marinara sauce and cream cheese to the skillet; whisk until cheese is melted, then stir in the broth mixture. Stir in tortellini, zucchini, and chicken; cover and cook for 8 minutes. Arrange mozzarella slices over the top, broil for 1 to 2 minutes, or until cheese is melted. Remove from heat; garnish with basil ribbons and serve. Simple, delicious, elegant and quick! One pot dinners can’t get much easier than this. Just several ingredients plus a bit of time, and dinner will be ready in a flash. 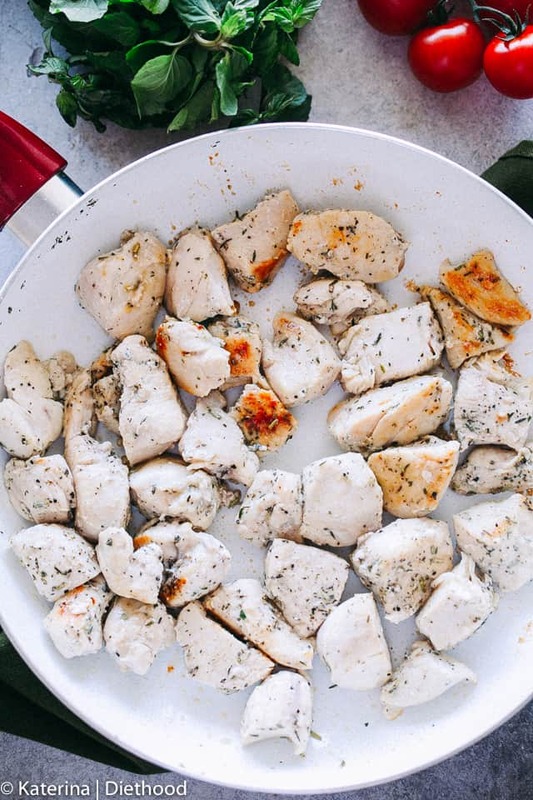 Add chicken pieces; season with oregano, salt and pepper. Cook for 4 to 5 minutes, or until chicken is browned and cooked through. In a mixing bowl, combine wine, chicken broth, and water; stir until well incorporated. Add marinara sauce and cream cheese to the skillet; cook over medium-high heat until cheese is melted and everything is well combined. Slowly whisk in the prepared chicken broth mixture; whisk until incorporated. Add chicken back in to the skillet; stir in the prepared zucchini and the tortellini. 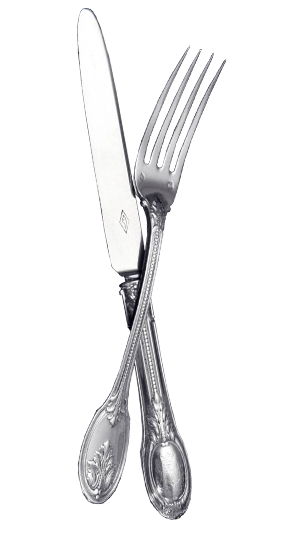 Reduce heat to medium-low; cover and cook for 10 to 11 minutes or until pasta is done. Remove from heat and arrange slices of fresh mozzarella over the top. Set under the broiler for 1 to 2 minutes, or until cheese on top is melted. Garnish with ribbons of basil.